DEFINE | The Inner Table is the time and space that each person carves out to individually meet with God. As Christians, we believe we are designed to know God and be known by him individually. It can be difficult to devote time to our Inner Tables in our busy, noisy world. But even though God’s presence surrounds us constantly, it is only by consistently taking time to be attentive to the Spirit that we can learn and grow. ENGAGE | Set aside a time each day that is devoted to practices that encourage individual communionwith God. The number of valuable spiritual practices is virtually endless, but some of the most popular ones include: Scripture reading (perhaps with the assistance of additional devotional material), prayer, journaling, Scripture memorization, and attentively listening to worship music. The amount of time devoted to this table will be different for each person, but, if you are just starting out, it can be as little as ten minutes each day! And, our weekly bulletin insert is a great place to find some Inner Table content that is designed to extend the content and themes of our Sunday sermons. DEFINE | The Common Table represents the small, intimate community of people with whom we walk through life. As the Spirit leads each of us individually, we can listen to one another’s stories and learn from the experiences of our friends. 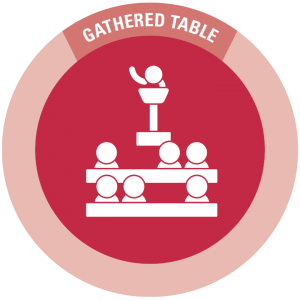 The Common Table is modeled after centuries of “small group” emphases throughout Church history, tracing all the way back to Jesus’ decision to spend most of his time with just twelve other people. ENGAGE | At this table we find encouragement, accountability and fellowship as we learn and grow together. There are several different ways to engage this part of the rhythm at First Friends. Each fall and spring there will be opportunities to join short-term “Runway Groups” that meet weekly for 6-8 weeks on average. Every Sunday morning, our Adult Bible Fellowship groups meet for an hour at the church between our worship gatherings. Or, if you would like to form a “Micro Group” with just a few friends, meeting at least twice each month, we can help you do that as well. And, several weekly/monthly times of study and fellowship are offered in a variety of formats. Joining one or more of these Common Table experiences is a critical part of the ongoing process of discipleship. If you have questions about how to enter one of these Common Table opportunities, please see Pastor Mike or Pastor Pete. DEFINE | The Gathered Table encompasses everything that happens within our church family. This table incorporates all of us as one large community. Aspects of this table include Sunday worship gatherings, serving within the ministries of the church, and participating in a variety of fellowship-oriented events. ENGAGE | The primary way to engage in the Gathered Table is to consistently attend one of our weekly worship gatherings, at 8:30am or 11:00am. No other table can provide the Spirit- filled experience of celebrating the love of God and grace of Christ as a unified Body of believers. Additionally, it is important to find some area of service within the life of the Church to which you can commit your time, energy, gifts and talents. Finally, church-wide fellowship opportunities are offered at a variety of times throughout the year. DEFINE | The Mission Table challenges each one of us to go into the world and make disciples, just as Jesus commanded. Living a missional, disciple- making life means that we must enter into the rhythms of life present in the world outside our church and our homes. As each of us becomes embedded within different places and activities, we listen in order to learn about the people around us so that we may love them well. As we build relationships, we pray that God will give us opportunities to share, in word and action, the hope we have in Christ. 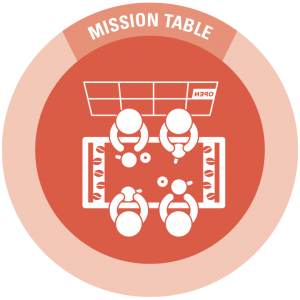 ENGAGE | Take time to seek God and speak with others about what Mission Table experience might be a good fit for you. Consider what kinds of things you most enjoy and then find out if there are events or activities happening within the community that match up with your passions, interests or hobbies. Or, simply choose a place to “be a regular.” Have coffee or eat lunch at the same place once or twice a week and get to know the staff and fellow patrons. By living faithful and hopeful lives while building relationships in these kinds of contexts, we can know, love, and share Christ with those around us. Children at First Friends, from toddlers through sixth grade, are an important part of our church family. Their INNER TABLE is fostered by the encouragement to read and memorize scripture as well as teaching them to talk to God in prayer. Often there is devotional material that can be taken home in order to further strengthen their relationship with God. The COMMON TABLE fellowship happens during the Sunday School Hour and during Kid Connection. Weekly, children learn from and discuss bible based curriculum to help them grow in their faith alongside their friends. Their GATHERED TABLE occurs on Wednesday nights at Friends For Christ (FFC). 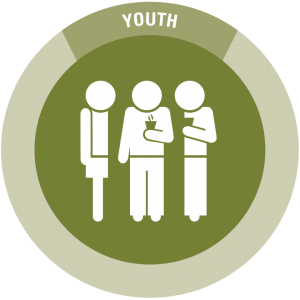 Here, kids meet together, share a meal, hear the Word, learn from scripture, play games, and create art. 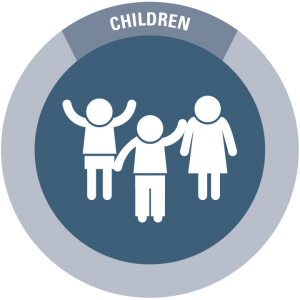 The children’s MISSION TABLE is mostly lived out in their schools and communities as they express their faith in Jesus to those around them. Many also participate in service projects and interact with their friends in a way that shows the grace and compassion of Christ. 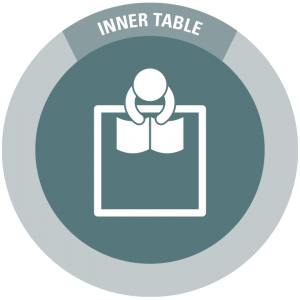 Our students in grades 7–12, are encouraged weekly to participate in their INNER TABLE by taking home devotional sheets from The Gate. With these, they are provided both scripture readings and meditation questions to ponder their life and relationship with God. Every other week at The Gate, they engage in the COMMON TABLE with intentional small group discussion time centered around the previous week’s message. There is another small group opportunity on Sunday mornings called Coffee & Conversations where they further discuss central themes from Wednesday nights. Their GATHERED TABLE is on Wednesday nights at The Gate. They share a meal together, worship and hear the Word together, and play games together. And finally, the students are empowered to live out their MISSION TABLE in their schools where they can walk confidently in the hope of Jesus as well as participating in both local service projects and mission trips. Contact Mike Barnes, Pastor of Discipleship, or Pastor Pete to learn more about the Discipleship Rhythm at First Friends Church or to learn how you can get involved within a specific area.